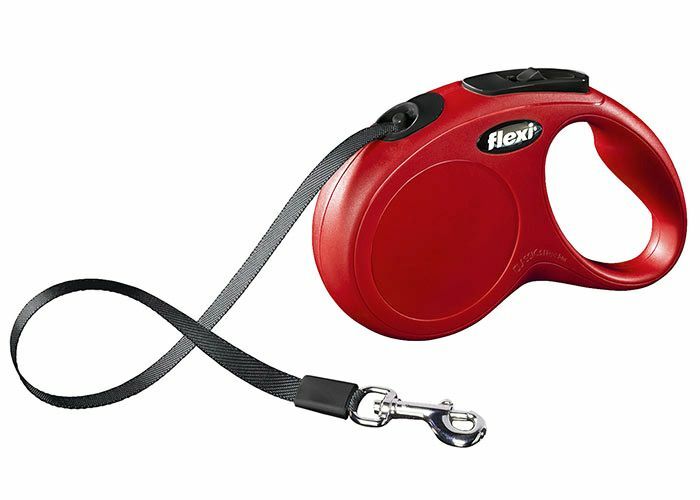 Flexi Leads UK - Flexi Extendable Retractable Dog Leads. FREE UK DELIVERY on all Orders! Welcome to Flexi Leads UK! - Independent Retailers of Flexi Extendable Retractable Dog Leads. FREE UK DELIVERY on all Orders! The Flexi Classic Tape Small has a 5 Metre tape and is suitable for dogs up to approximately 15Kg. The Flexi retractable dog leads have become one of the most popular ranges of dog leads in the world. Flexi leads never slacken, as the lead is always subject to sufficient tension and as the animal walks closer, the lead retracts into the handle. With the help of the integrated braking system, the dog is always under control and the length can be adjusted and locked in place if required with the locking button. Express Next Day Delivery (Next Day if ordered before 12 noon - otherwise guaranteed for the day after, Mon-Fri). We either use Royal Mail Special delivery, or UPS depending on weight. Please note: Express Next Day delivery may not be available during busy periods. If you choose an express delivery option (Special Delivery), then we will dispatch the item the same day (Monday to Friday) provided the order is received before 12pm (noon) - although it is still possible to receive the item the next day if the order is placed after 12pm.. If you choose 1st class postage, we will also aim to post your order within 24 hours. Although 1st class post usually arrives next day, it can take longer in some circumstances. Our website Flexi-Leads.co.uk offers a wide selection of Flexi Extendable & Retractable Dog Leads & Accessories with FREE UK Delivery as standard and Fast Dispatch. Please note that we are Independent Retailers of Flexi Dog Leads - we are not the manufacturer. We stock a large selection of Flexi Extendable Dog Leads ready for dispatch across the UK.. Copyright © 2018 Flexi-Leads.co.uk. All rights reserved.